Quinault Rainforest, part of Olympic National Park, is on my shortlist of places to visit again. In July 2013 on my way from San Francisco to Boston, I visited this mossy, verdant wonderland in the northwest corner of Washington State. I could have spent a month taking photos there. The park features overflowing ferns, moss growing off giant trees, and numerous other epiphytes that only grow where it rains all the time. Epiphytes are plants that grow on other plants in a non-parasitic way. Examples include ferns, mosses, spike mosses, and lichens. It rains almost fourteen feet a year in the park, so the place is very green. The paths were particularly beautiful because the sunlight shone through the hanging moss and ferns and created a green backlit effect. Much of the lush greenery was brightly dappled. The mixture of shadow and light was spectacular. Many fallen trunks in stages of decay were thick with moss growth. Shades of green were very intense. This place is loaded with ferns and moss. Plants grew from every square inch of the earth. Moss draped from every tree. Light filtered through everything. The park was scenic and postcard-perfect. 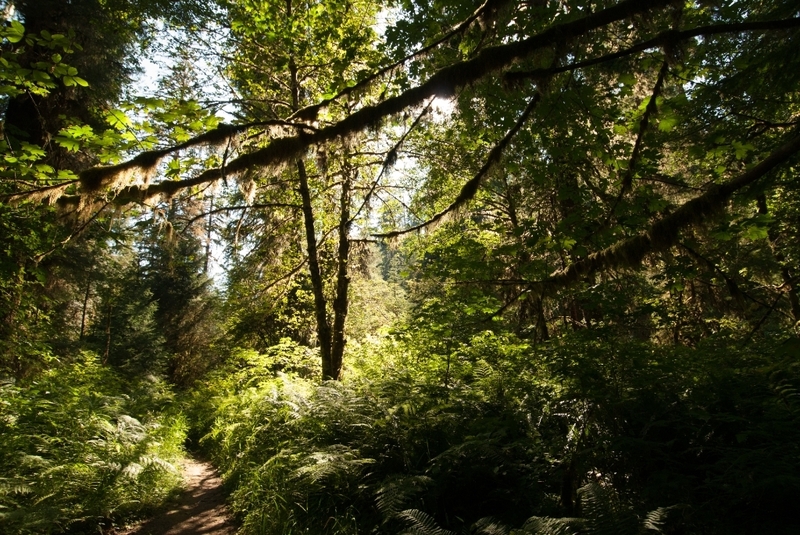 There are hikes of shorter and longer durations, all radiating out from Lake Quinault in the center. It’s a very family-friendly park. There’s even a seafood restaurant on one edge of the park with a view of the sunset. Posted in response to It IS Easy Being Green! I took a road trip across country and stopped at many National Parks, including Olympic National Park. It features unbelievably beautiful lush, mossy rain forests. In my first post, I confused Quinault and Hoh and called it Qoh! Oops. This one is Hoh Rain Forest. Gloomy looming large figures! So much moss. 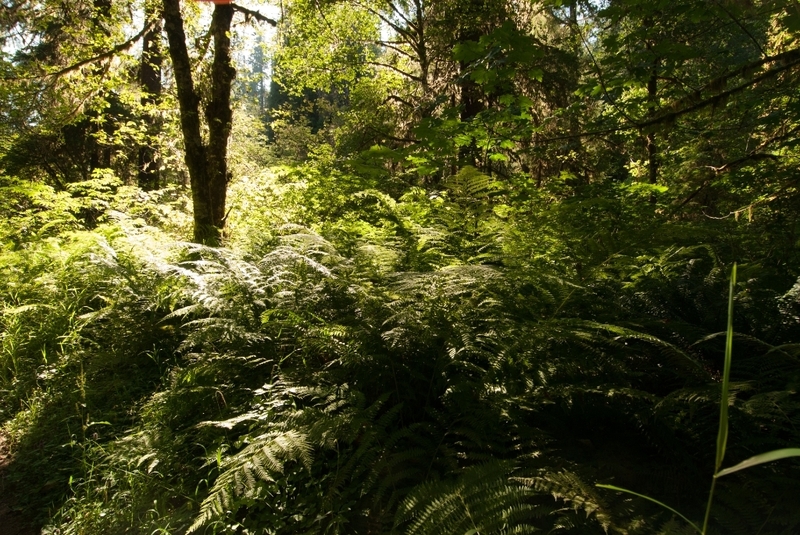 This one is Quinault Rain Forest. So many ferns! Ferns all the way down. Another photo from the extremely mossy Olympic National Park in Washington State. I really could have spent a month in this place. So tropical! Everywhere I went it was crazy-thick ferns, moss dripping off giant trees, strange frondy things that probably only grow where it rains all the time. I love jungles. I want to visit Costa Rica. I’ve been to Mexica, Belize, and Guatemala. Not bad. 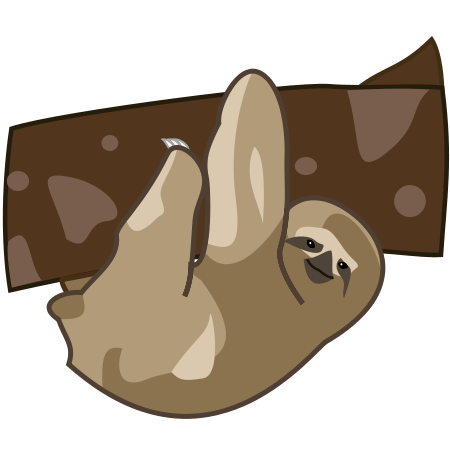 I would love to see some sloths either in the wild or in captivity. I’m not a big fan of captivity but what are you gonna do, those animals need help. Also they look like muppets. How can you not want to help an animal that looks like a muppet, and moves so slowly. When I was in Olympic National Park I was getting nervous about how much of the country I had to cover before hitting the east coast. I had spent a good week already going straight north through California, Oregon, and Washington. I did not want to short-change the trip east. The country I had to cover looked pretty large. I also made a mistake in booking the hotel inside Olympic National Park. I meant to reserve a hotel room in the center of the park, but instead I reserved an RV hookup. Whoops! I didn’t realize this until I drove around the wiggly edges of the park all night through dense fog and arrived at 7am, exhausted. All rooms were booked. My disappointment was almost as bad as my exhaustion. I wanted to take a shower and sleep in the worst way. That is when I developed my second rule of the road trip (first rule involved no hiking with the hood up): don’t drive more than 8 hours in a row, ever. The guy at the desk took pity on me and tried to book me in the nearest nice hotel, but that was also fully booked, so he booked me at the Hungry Bear Cafe, Motel & RV Park an hour away. It turned out to be very cozy and cute. Each room was its own self-contained cottage. Very reasonably priced. Aside from the hour drive, which I obviously wasn’t keen on, the motel was just grand. I’d stay there again. Key part of this story is that they lady that ran the motel/diner insisted that I see the very far northwestern point of the peninsula, Cape Flattery, before I head east. I was a little concerned that I would not have time, but there was something terrifically charming about this grandmotherly lady who ran the diner like a champ and gave me inside information about the best local places to see. 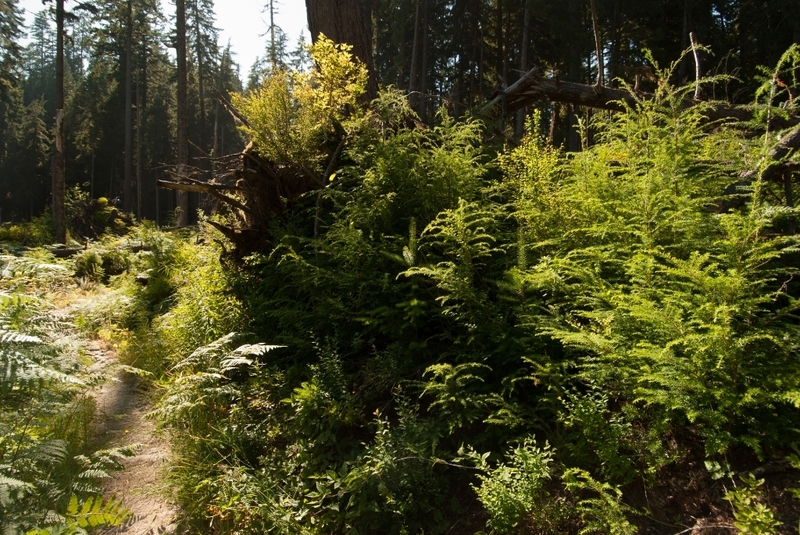 A super-lush gentle forest with an adorable little path goes on for a maybe one or two miles. WHERE DO THEY KEEP THE HOBBITS? Adorable. Just adorable. Whales! Seals! Water fowl! Some kind of… HAWK! So thank you lady, that was a good find. In terms of ease of hiking, while other parts of the park might be a little more strenuous, this is gentle for all ages and quite picture-book-esque. Cape Flattery was the farthest northwestern point of the U.S. excluding Alaska. On the way back I was so far north that my cellphone beeped “WELCOME ABROAD!” with instructions for how to dial back into the United States. I had to call AT&T and instruct them to lock off Canadian cell towers. I definitely recommend July as the time of year. I was comfortable in a light jacket. As I got closer to the coast, a thicker jacket. In terms of booking rooms, my sense is that you need more than a week in advance to get something inside the park for prime-time July. I had no trouble finding something on the edge of the park (such as the Hungry Bear place). Since I was doing a road trip I had to wing it a bit, but under other conditions you might want to plan it out more. It is hard to describe how unbelievably hobbit-like Olympic National Park is in July. The thick verdant nature of everything is really hard to capture on camera. I was lucky it wasn’t raining. Everything was covered in moss. Electric poles: moss. Electric lines: moss. Everything: moss. I could imagine houses get quite dingy if you don’t keep them dry. I would not want to live here, I think I’d feel damp too much of the year, but it was quite resplendent mid-July. It was also not very busy. I hiked Quinault Rain Forest. I must have been happily marching along for two hours by myself without hearing a soul in the world, lah lah, my head meandering about how nice the green stuff is and whether I’ll see an elk, when all of a sudden some dude briskly walks past saying EXCUSE ME. I also had my hood up to keep the bugs off, so I really didn’t hear him coming. Sheesh I nearly had a heart attack. After that I stopped hiking with my hood up.